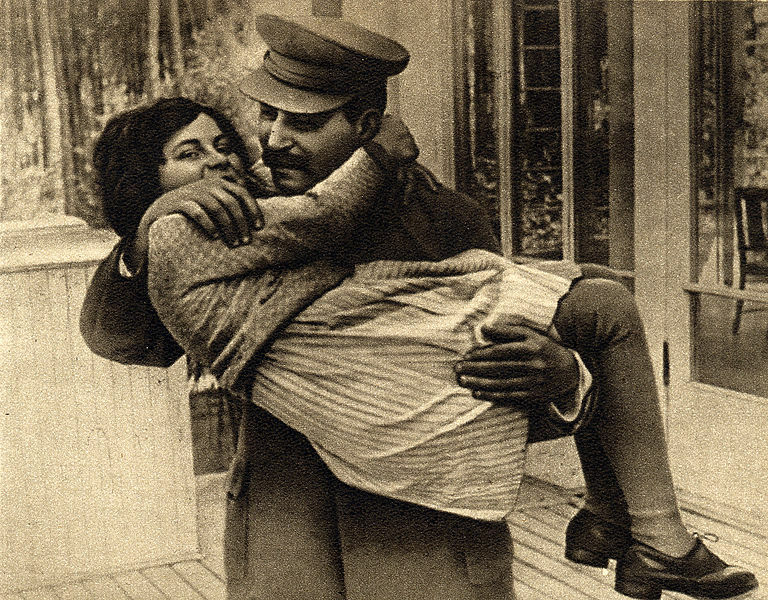 Svetlana Alliluyeva was the daughter of Joseph Stalin. In her memoir, Twenty Letters to a Friend, she struggles to come to grips with her childhood and in particular her relationship with her father, who he was a man, father, husband, and leader. According to Wikipedia, Svetlana caused an international stir when she defected from the Soviet Union in 1967. Interesting that this is the same date her memoir was published. Svetlana was born in 1926 and passed away in 2011. (Stalin died in 1953.) Wikipedia says as of 2010, she was living in Wisconsin. This book came to me from my grandmother. She didn’t give it to me, but rather, I inherited it when she died. My grandmother was a member of the Book of the Month Club, and this was one of the books she received. My grandmother was very well read, but I don’t think she ever had the same kind of fascination with Russia that I developed. As I read this book, I felt a wave of compassion for Svetlana. After all, it’s hard to top having Stalin for a father. For one, there is the mysterious death of Svetlana’s mother. Was it really a suicide? Did Beria do it? Could Stalin have? How culpable was Stalin in the terror? She seems to want to shift the blame, painting Stalin as a man whose passions could be manipulated, a man with tremendous paranoia that worsened over time. What is touching is that she loved him, and I suppose the monster that I have read about in my history classes must have loved her too. There are a couple of things that could have improved her memoir. She didn’t say much about the Soviet gulags that her father worked so hard to populate. She also didn’t write much in scenes. Most of her letters were strictly telling, not much showing. The letters she wrote about her mother and her first husband were the most gripping, where I actually forgot I was reading and lost myself in her story. Svetlana is extremely self-conscious throughout her memoir, always watching what she says, always crafting an impression. And this is certainly understandable given the very public nature of her life. Unfortunately, in this writing, she hasn’t unraveled her own denial, even though I have the feeling that she sincerely tried. By Doris Lessing; Perennial, An Imprint of HarperCollinsPublishers; @1987; 78 pages. This book addresses one of my primary questions about human history and human behavior. How is our species capable of doing the horrible things that it has—and is? Why do we do it? Can we stop? A few months ago I watched somewhat recently discovered film footage (A Film Unfinished) which documented the living conditions of the Jews in the Warsaw slums during World War II. Horrified does not begin to approach my reaction. I have seen photos before, but the film footage and the fact that it was filmed, and staged, and shot over and over, was so callously heartless, I guess, I had not conceived of this possibility before. What horrible evil. How could anyone participate in such a thing? We know that this kind of behavior is not limited to World War II or to the Germans. It can be found in many societies and at many times in human history, and undoubtedly some iteration of it is happening right now. Lessing, thankfully, does not go into graphic detail, but does give us anecdotes and references some psychological experiments, including the famous Milgram experiment, in which it takes shockingly little to convince people to torture others and excuse themselves by saying they were just following orders. Lessing maintains that humans (any of us), because of our psychology, are highly susceptible to acting in horrible ways in certain situations and can be influenced easily in groups. It is very rare for any of us to go against (disagree with, challenge) our groups. She asks how is it that we have this information about ourselves but have not yet incorporated it into our institutions of government so that we don’t repeat these kinds of horrible actions? If we can just admit that we are wired in certain ways, we can put safety measures in place to stop ourselves. This is a great book and an easy short read. I highly recommend it. 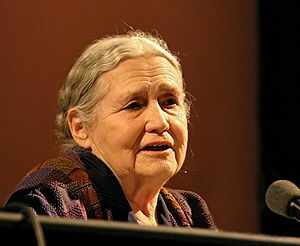 Doris Lessing is a prolific author and is most famous for her novel The Golden Notebook. She won the Nobel Prize in Literature in 2007. By Noam Chomsky; 2006; Holt Paperbacks. I saw a coworker reading this book and asked to borrow it. I remember hearing about Noam Chomsky while I was in college. He has one of those names that some people yelled while others whispered. He was never on any of my reading lists. Noam is a professor of linguistics and philosophy at MIT and has a long list of publishing credits beginning in the 1960s. A radical, some might say, Noam claims to be a conservative—following the dictionary definition. I’m all ears. 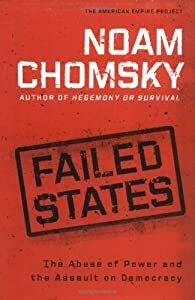 While Failed States discusses many important issues, Noam’s writing style, which employs frequent sarcasm and irony, was greatly distracting to me. Noam expects his readers to be thinking every word of the way and to already have a strong grasp of the subject matter, that of U.S. foreign policy from roughly 1776 to 2005. As a concerned citizen, I found the premise of the book, that the United States is a failed state, worth examination. It’s certainly not anything I would ever hope for, but I think to solve a problem, you should be willing to think it over. What many in our country call the “liberal news media,” Noam calls the “elite news media.” It seems many of us are unhappy with the job done by the news media. I hate to be too critical of the media, of the individuals involved. I know it must be a hard and dangerous job for many. Perhaps, I tend to blame the owners of the media more than the people working in its ranks. Noam is interested in rhetoric, as am I. He cites the rhetorical framework of John Quincy Adams that has been “inherited and elaborated on by successive generations of American statesmen…[It] rests on three pillars: the assumption of the unique moral virtue of the United States, the assertion of its mission to redeem the world, and the faith in the nation’s divinely ordained destiny.” I see this in every election, often in the place of any real discussion. While on the surface, this argument seems like a good one, I tend to think that taking care of a person in their later years is going to cost more than taking care of that person as a child, what with medical bills, nursing home costs, debts, etc. But who am I to say. I am just someone who is likely to need social security payments and who wants them, having paid into the system since my first job. Noam doesn’t bring it up, but I don’t understand why the rich would collect social security payments, being rich and all. But again, what do I know. It also seems to me that there are many major crises that potentially loom in our foreseeable future. Noam ends with a suggestion that “facts, logic, and elementary moral principles should matter.” I think that’s fair. I can agree with that. It would be nice if we could put our egos aside and stop arguing. I don’t see it happening, but it would be nice. I’m always disappointed when a book that focuses so heavily on gloom and doom ends on a positive note. I’m sorry, but the last paragraph is way too late to hint that there is still hope. Apparently, I should keep my chin up because there are so many ways I can become engaged in democracy aside from voting and attending the random demonstration. Noam has already banished any hope that my elected politicians will pay much attention to my emails, that I have an electoral system that’s fair and representative, or that without a substantial amount of money I can make an impact. So how? I’m too dim to know, and Noam, already retreating to his ivory tower, is not bothering to say.